Parents and expectant parents want to keep their babies safe and their dogs happy. Your dog has always been your first baby, and now you’ve got a human baby joining the family. It’s an exciting time! Are you wondering how to keep your dog happy when your baby arrives? Do you have a baby who is starting to crawl or walk and making your dog uncomfortable? Are there behaviors your dog does that you’d like to change before baby arrives? Would you like to help your dog learn how to get along with your baby and build a lasting bond your whole family can enjoy? Woof! 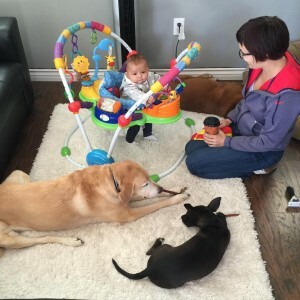 Dog Training’s owner, Erin Vejar, specializes in dog and baby dynamics. She’s a licensed educator with Family Paws Parent Education and frequently works with parents to prepare their dogs for life with a baby, or to change existing dog and baby dynamics when things might not be going as smoothly as you would like. Here are some options to help you get started. Gift certificates are also available for dog and baby training, if you’d like to give a friend or family member the gift of preparedness. Schedule a private training session to get started preparing your dog for your baby or changing an existing household dynamic. Attend one of Erin’s Dogs and Babies presentations at Babies-R-Us or other local location. Email Erin for upcoming dates. and situations you can help your dog to become comfortable with before your baby arrives. Read articles or watch videos about dog and baby training on the Family Paws Parent Education website. How did you hear about Woof! Dog Training?